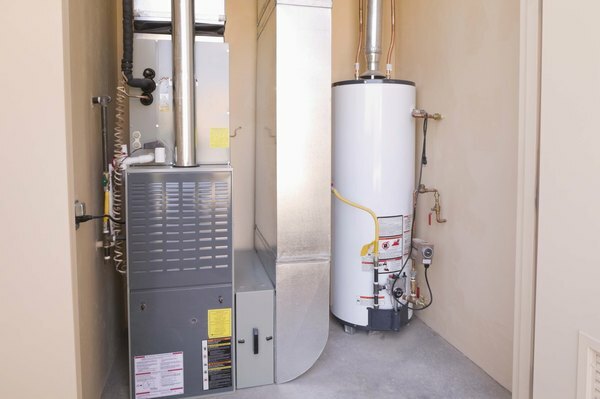 A new furnace can bring tax credits. Buying a new furnace can do more than just keep you warm in winter and potentially help you to save money on your utility bills. New furnaces can also be tools to help you reduce your tax liability. Whether you're claiming a special credit for energy-efficient furnaces or just using the same tax deductions that you have available for other large purchases or home improvements, the Internal Revenue Service will help you recover some of the cost of your new furnace. The Internal Revenue Service offers a $150 tax credit against the cost of an Energy Star-certified furnace burning natural gas, oil or propane. To qualify for the credit, your furnace must have an Annual Fuel Utilization Efficiency (AFUE) rating of 95 percent efficiency or better. The credit expires at the end of 2013. If you itemize your deductions on Schedule A, you may be able to write off the sales tax that you pay on your furnace and its installation. The IRS lets you choose between writing off your state income taxes and your state sales taxes. If your furnace was expensive or if you bought other expensive items, you might get more benefit from writing off the sales taxes you paid than from writing off your state income taxes. As with the tax credit, the sales tax write-off also expires at the end of 2013. When you sell your house, you are subject to capital gains taxes on any profit that you earn above the exclusion. To calculate your capital gain, the IRS doesn't only look at your original purchase price. It looks at what you paid for your house and any improvements that you made. As such, you can add the cost of your furnace to the cost of your house, reducing your capital gains tax when you sell. When you have a home office, you get to claim a depreciation allowance on the amount of your house that you use as a home office. Because the furnace is an improvement that benefits your whole house, you can depreciate a proportional share of the cost of the furnace. For example, if your home office is 13 percent of your house, and your furnace cost $8,700, $1,131 of the cost is depreciable. HouseLogic: Did You Sell Your Home After Making Improvements?